This is a list of notable street newspapers. A street newspaper is a newspaper or magazine sold by homeless or poor individuals and produced mainly to support these populations. 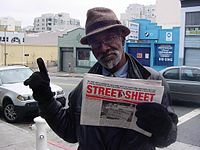 Most such newspapers primarily provide coverage about homelessness and poverty-related issues, and seek to strengthen social networks within homeless communities. Street papers aim to give these individuals both employment opportunities and a voice in their community. 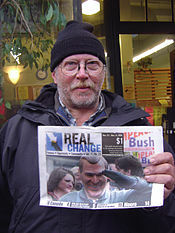 In addition to being sold by homeless individuals, many of these papers are partially produced and written by them. ^ Dodge, Chris (August 1999). 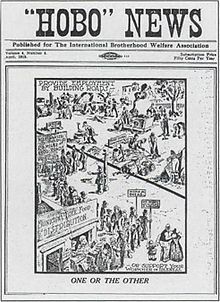 "Words on the Street: Homeless People's Newspapers". American Libraries. pp. 60–62. Archived from the original on 2009-03-17. ^ Hemens, Aaron (9 November 2016). "The Wrench newspaper lets Ottawa's homeless tell their own stories". Metro News. Retrieved 21 March 2017. ^ Winternitz, Felix; Bellman, Sacha DeVroomen (18 November 2008). Insiders' Guide to Cincinnati. Globe Pequot Press. p. 360. ISBN 978-0-7627-4865-5. ^ Cabrera, Carlos (March 30, 2011). "Chicago homeless magazine wises up". Chicago Journal. Archived from the original on 17 March 2014. Retrieved 23 April 2014.